Can anyone ID this little rosette? I bought it last fall as a tiny rosette, and now it branching, producing offshoots, and flowering, and I still don't know what it is. 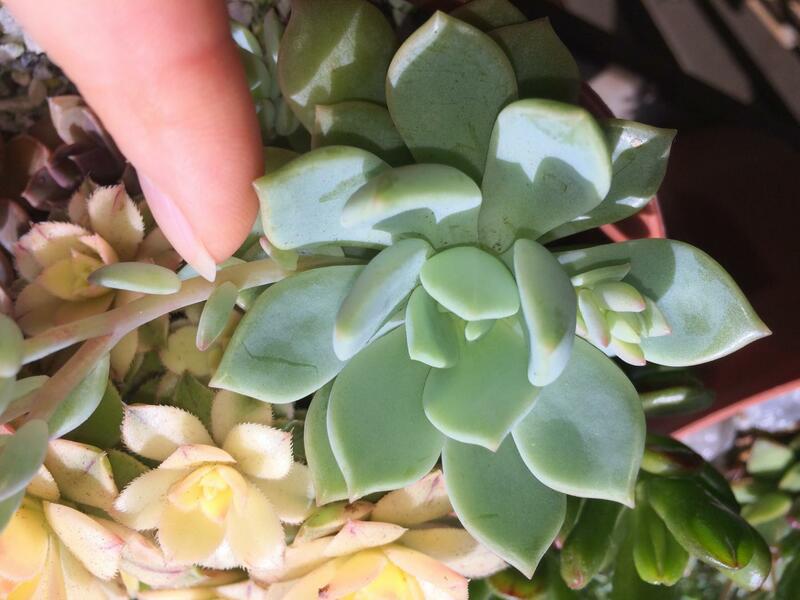 The petals seem coloured on inside, maybe x Graptoveria. With a clear picture of the flowers fully opened, it will be better. and what is the diameter of the rosette ? The rosette is only about 2.5 inche's across. Here is another photo with my index finger for scale. There is just the one flower so far, but it has opened a little more so you can see the color inside (pretty). Hmm... I've been looking up Graptoverias. Graptoveria 'Moonglow' maybe? I see the flower of x Graptoveria 'A Grim One', but I dont cultivate this plant and I don't know if the rosette is correct. There is no xGraptoveria 'Moonglow'. 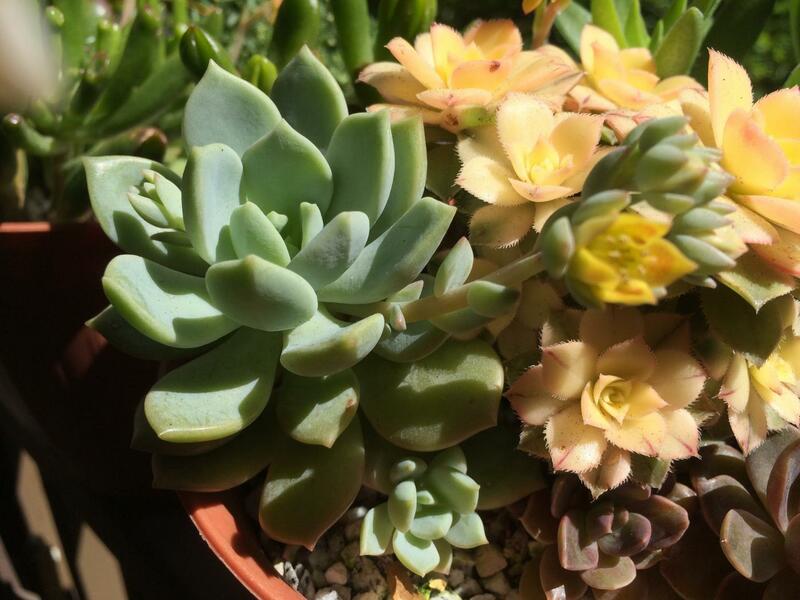 Tom is right, your plant is xGraptoveria 'A Grim One'. Thanks very much, both of you. If I may ask, how does one differentiate between G. 'A Grim One,' and the plant commonly referred to as G. 'Moonglow' in so many places on the Internet? Is the latter the same plant, but renamed by a lay person, or is 'Moonglow' a different plant, but that doesn't exist because it isn't formally recognized by an accepted authority? Maybe neither explanation is correct. How does one know which cultivars really do exist, and which are... explained in some other way? 'A Grim One' has been described ; but there is no description of x Graptoveria 'Moonglow'. Apparently, the plant distributed with the name 'Moonglow' is 'A Grim One' ; 'Moonglow' would be a mistake or a superfluous trade designation. Thank you, Tom. Is there a single place where I can find all the described Crassulacea species and cultivars? A horticulture society database or something? Click on the tab Website (top of the page), you will see each genus, and you can use the search engine. 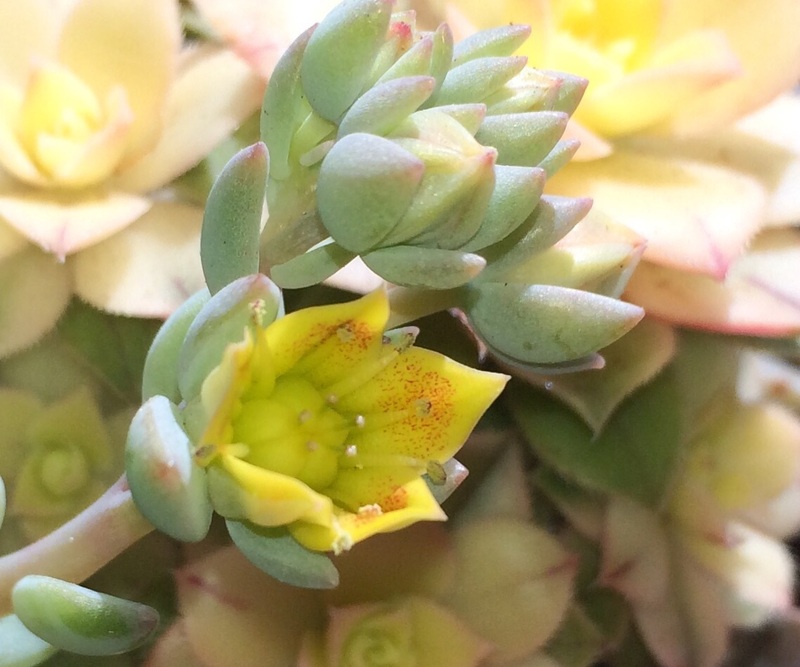 I remember very well, the photo of 'Moonglow' (Echeveria 'Moonglow', xPachyveria 'Moonglow') has intrigued many a collector years ago and seduced him / her to order that plant only to discover that it was not what he / she expected but the same as a plant he / she was already growing. All due to the lacking of a flower photo ..... indicating that the respective nurseries themselves never had checked the genus of the plant they were advertising. Thanks very much, Tom (and Margrit). I'll poke around and see if I can learn something. « Thanks very much, Margrit (and Tom) » : I'm just a member.